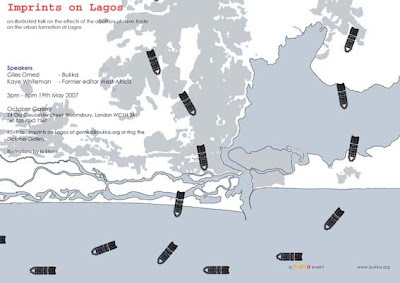 "Bukka will deliver a talk on the effects of the abolition of slave trade on the urban formation of Lagos. At the October Gallery in London on 19 May 2007, 3pm to 6pm.The talk will be by Kaye Whiteman and Giles Omezi." Click here for more. Now if Bukka could develop an in-country chapter - well that would be something to cherish. Keep the energy flowing, Giles..
Bukka Lagos exists, It is headed by Papa Omotayo who is based in Lagos drop him a line through our website. We will be doing more work closer to home, participating in next months African Architecture conference in Kumasi, Godson Egbo will be delivering a paper. Keep an eye on our website.